Among those displeased with the movie Noah, the most frequent objection was to the Rock People, a group of creatures the critics found preposterous. They had no issue, however, with the Rock People working alongside a 600-year-old man. There are many who interpret the Flood story as an allegory about mankind’s fall and redemption, and others who note that there are similar pre-Genesis accounts, such as Gilgamesh. We are unconcerned here with the morality or literary qualities of the tale and are only addressing the scientific implausibility of it being literal. A decade ago, I was under the impression that a sizable majority shared my view. But since then, I have known many adults, at least one with an advanced degree, who have expressed sympathy for the literal interpretation. So, in the country that launched Voyager I and conquered polio, I will employ computer technology and the Internet to argue against the proposal that a 600-year-old man built a giant boat and filled it with 100 million critters and their 13-month food supply, in order to protect the inhabitants from a flood that covered Mount Everest, and that ended with kangaroos hopping and swimming from Turkey to Australia. In this Marsupial Movement, even if we allow stops on every piece of the Indonesian archipelago after leaving Malaysia, the final leg to Australia requires a swim of 300 miles. Also making their way to new homes would be animals found only on Madagascar, Antarctica, the Galapagos Islands, Papua New Guinea, Palau, and Costa Rica. One creationist offered that these animals could have floated there on unspecified objects. It remains unclear what the nature of, or source was, for this armada of seaworthy transportation that came supplemented with adequate food, water, and shelter. Before riding this mystery debris for thousands of miles, there are other obstacles to overcome. Answers in Genesis puts the flood account at about 4,400 years ago. This conflicts with records of civilizations in China, Egypt, and Babylon before, during, and after this time. Then we have the literal mountain of a problem relating to all of Earth being covered. This means that Mount Everest was under water. At an altitude of 29,000 feet, persons could not survive more than a few hours. To submerge Everest in 40 days, a nonstop libation of 360 inches of rain per hour would be required. By contrast, the heaviest rainfall ever recorded is four percent of this. The tremendous force this deluge would create would tear apart a vessel of gopher wood and pitch. Some of my fellow skeptics have noted the dimensions attributed to the ark are 50 percent larger than any known wooden boat. Since ancient civilizations produced the Moai, Stonehenge, and Pyramids, I can charitably overlook this point. Getting representatives of every creature on that boat is another matter. In Genesis 6, God tells Noah to bring a male and female of every living creature into the ark, evidently delegating to Noah the task of deciding what to do with the hermaphrodites. 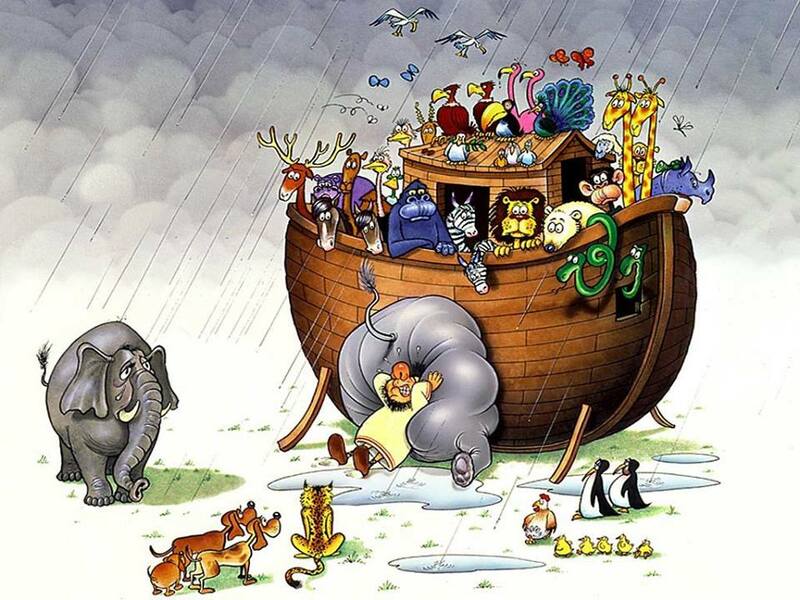 The Bible never makes it clear whether Noah gathered the animals or if they came to him. But either method is fraught with serious problems. In the first scenario, Noah makes his way to Antarctica to get the fur seals, to Alaska to get the caribou, to Indonesia to bring back the Komodo Dragons, and he safely corrals tigers, crocodiles, and copperheads. Moreover, the dictate in Genesis 6 allows no exceptions for microbes or sea life, so Noah would have to identify the single-cell organisms and transport jellyfish and blue whales. He has to do all this while building a 450-foot boat with Bronze Age tools. Oh, and per Genesis 7:4, he has a week to do this. Remember that the next time you complain about multitasking. Allowing for the easier method of the animals seeking Noah, we have no explanation for what prompted the beasts, most of whom don’t migrate, to leave their homes and make their way to Mesopotomia. There is no answer for how animals that need special climates or diet would survive, and no explanation for how flightless animals made their way from America. I have heard two main creationist counters to this. The first posited that animals such as penguins, lions, and walruses were living in Mesopotamia at the time, an idea with zero scientfic or historic backing. The other proposes that God magically did it, an idea with zero scientfic or historic backing. By whatever method Noah and the animals hooked up, we still have to wrestle with the lack of space. Even if all the animals had been babies or in eggs, the ark would have been much too small to accomodate between two and 14 of every creature. Besides the animals, there would had to have been supplies for food, water, cleaning, and sanitation. The already impossible conditions would have grown worse because, even if babies, many of the animals would grow to full size within 13 months, the approximate time spent in the ark per Genesis 7 and 8. At the other end of the spectrum are animals with life spans of less than a year. Furthermore, parasites would have either killed their only source of sustenance or died from the lack thereof. The idea of tens of millions of creatures fitting on boat less than two football fields long is too much for even Ken Ham to manage through mental gymnastics. For the only time I’m aware of, Ham deviates from a literal interpretation of the Bible. For him, the reference to every kind of animal doesn’t mean every kind of animal. It means species. For instance, Noah took only two bears, not two each of the polar, brown, Kodiak, sun, grizzly, and black varieties. But the purported time span of 4400 years is insufficient to account for the variety of species in the modern day. Creationist John Woodmorappe arrives at a figure of around 16,000 animals. He came to this number not through a thorough study of zoology, but by figuring out how many animals could fit on the ark and working his way backwards, mixing Orders and Families when needed, and using creative biology. If we further tighten the pretzel we’ve bent ourselves into and allow the 16,000 animal figure, other issues remain. Genesis references just an 18-inch window at the top of a three-tiered behemeoth boat. This would be a woefully inadequate ventilation system, which would quickly be exacerbated by the mounds of excrement and consequent methane gas. As to where all the corpses ended up, Answers in Genesis offers that fossils are animals killed in the flood. But this would require every animal, including those extinct, to be in the same level of the geologic column. In actuality, the most simple life forms are much further down, and radiometric dating shows them to be billions of years old. By necessity, I have kept the scientific objections basic. I lack the competence to address the more complex ideas. But I want to share a couple of the advanced ones in order to give a sampling of the scores of other objections raised to this being a literal tale. In the Marshall Islands, there are coral reefs that are hundreds of feet thick. Forty days of 360 inches of rain per hour would have obliterated the coral. Yet the rate of deposit reveals the reefs have survived for 100,000 years. Futhermore, rainfall this heavy would have created a heat that boiled the water it was striking and kept it from rising. So this story, literally, does not float. I suggest seeing the movie instead. It’s not real either, but at least you get Rock People. So what’s the problem? Kangaroos can swim.